Canis Minor. © 2003 Torsten Bronger. 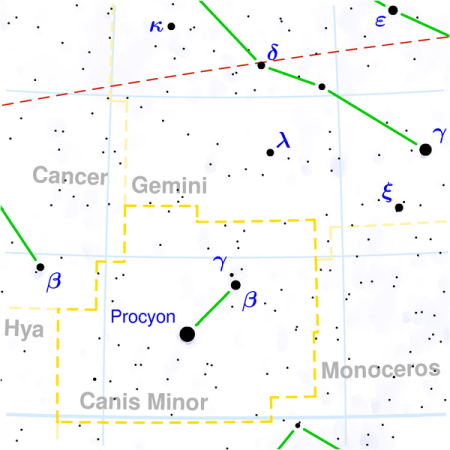 Canis Minor (abbreviation CMi), the Little Dog, is the lesser of Orion's hunting dogs; a small northern constellation to the east of Gemini. Its brightest star, Procyon, forms the northeast apex of the Winter Triangle. See below for details of the constellation's brightest stars. 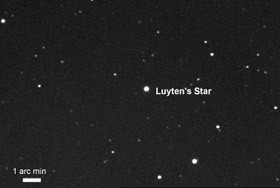 Luyten's Star (GJ 273) is a red dwarf in Canis Minor which, at a distance of only 12.4 light-years, is a relatively near neighbor of the Sun. It is about one-quarter as massive as the Sun and has about one-third of the Sun's radius. In orbit around it have been found two exoplanets. The outer of these is a super Earth that lies within the star's habitable zone. The inner planet is slightly more massive than Earth, making it one of the least massive planets to be discovered using the method of radial velocities.